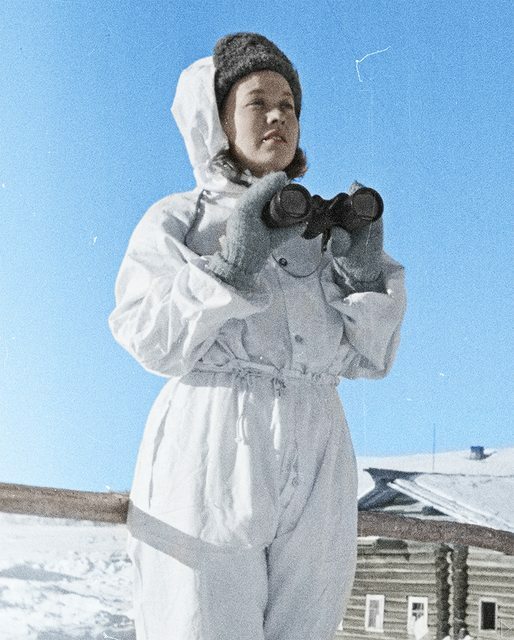 Continuation War, day by day. "The Continuation War refers to the hostilities between Finland and the Soviet Union during the Second World War, from 1941 to 1944." Lots of things to cover during the Interim Peace time, so let's get to it. All available trains and trucks are to be used to help evacuate people from the lost territories. President Kallio gives radio speech praising Mannerheim. Moscow Peace Treaty is ratified by the Finnish parliament. Last sections of Viipuri are evacuated. USSR news agency TASS informs that any possible defense alliance between the nordic countries would be seen as anti-Soviet Union and against the Moscow Peace Treaty. Russian troops who had been encircled in Kuhmo at the end of the war retreat back to USSR side of the border. At midnight, control of Hanko peninsula is turned over to the Russians. Planning meeting for the new defensive line, the so called "Salpa-line" is held in Inkilä. Mannerheim and five generals take part in the planning. Finns start to build fortified lines on the Finnish side of Hanko peninsula. Finnish army completes the withdrawal to the new border as Värtsilä and Maaselkä are emptied. Mannerheim continues in his role as the Commander-in-Chief of the Finnish Army. Russian foreign minister Molotov warns the nordic countries that USSR would not allow a nordic defense alliance to be formed. National aid collection for Finland in Sweden crosses 33 million krona. Last edited by Dowly; 03-15-2016 at 05:58 AM. Interior Ministry says it will cover the expenses of anyone who wants to move to Finland from the lost territory in the next two weeks time. Russian troops left in Petsamo cross the border back to their side. Release of POWs begins. Finland releases 792 POWs, USSR 107. The Karelian Union is formed to help the evacuees. Olympic games, which were to be held in Helsinki are cancelled. Ministry of Education announces that schools will open again in September. Finnish government decides to continue war time censorship. New border agreement between Finland and USSR is signed in Moscow. I take my flat cap off to you Dowly, really looking forward to this one and I'm sure you will do a great job with it just like your last one. J.K. Paasikivi writes in his report from Moscow that USSR does not appear to pursue any more claims from Finland. They are content with the Moscow Peace Treaty. The President awards Mannerheim with the Cross of Liberty 1st Class. Finnish General Leonard Grandell is in Germany to negotiate the purchase of armaments. USSR returns over thousand civilians who were captured in the "Hyrsylä bend" area during the Winter War. Remembrance Day. Joensuu, May 19. Great job Dowly, thank you. Of all the forms of Martial Arts, Karaoke causes the most pain! USSR demands back both military and civilian material that was evacuated from the Hanko Peninsula before it was turned over. USSR returns 254 civilians who were captured in the Juntusranta area (Suomussalmi) during the war. Finnish passenger plane "Kaleva" (Junkers Ju-52-3/mge) with 9 people onboard and carrying 227 kilos of diplomatic mail is shot down by two Russian DB3-T bombers near the lighthouse of Keri in Gulf of Finland. Passengers and crew were killed. The mail left over after the crash is picked up by a Russian submarine (Shch-301). Russian Lieutenant-General Hohlov later in his memoirs changes the date to June 23 and writes that "Kaleva" had flown without markings towards occupied Estonia and had been shot down as a spy plane. USSR invades Estonia and Latvia. USSR shows interest towards the Petsamo nickel mine. J.K. Paasikivi offers a 50/50 split of the nickel output between Germany and USSR. USSR refuses the offer and proposes they get the mine in full. Trade treaty between Finland and USSR is signed. The Compensation Act is passed to offer financial help to those evacuees who left behind property in the lost areas. Soviet Union repeats its demand to Finland to hand over material evacuated from Hanko Peninsula. 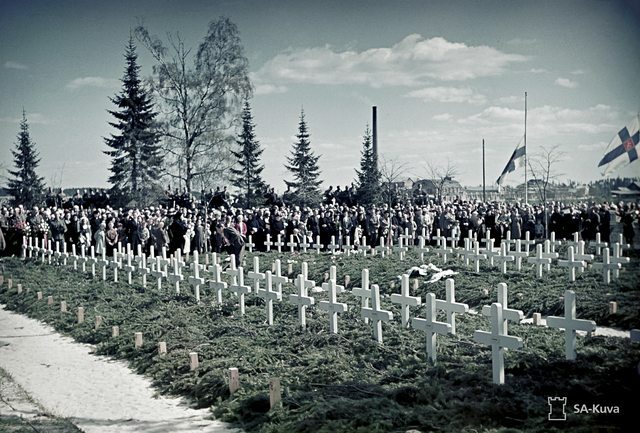 Games are held in Helsinki's Olympic Stadion in remembrance of athletes who died in the war. Puppet governments in Estonia, Lithuania and Latvia petition to join the Soviet Union. Germany begins planning invasion of Soviet Union. Soviet Union "accepts" the request of Latvia and Lithuania to join the Soviet Union. Union of Brothers-in-Arms is formed in Finland. Demonstration held by the 'Finland-Soviet Union Peace and Friendship Society' in Hakaniemi ends in violence between the police and the demonstrators. Due to pressure from Soviet Union, Finnish Foreign Minister Väinö Tanner resigns. Soviet Union proposes Finland to transfer the Vallinkoski hydro plant under Soviet control. Mannerheim meets with German Lieutenant-Colonel Joseph Veltjens. Veltjens is willing to sell war materiel to Finland. Granting transit rights to German Army is also discussed. The inner circle of Finnish government shows green light to allowing German troop movements to Norway via Finland. Molotov and J.K. Paasikivi meet in Moscow. The topic of discussion is the 'Finland-Soviet Union Peace and Friendship Society'. Molotov expresses concerns that the Finnish government is not genuinely interested in friendly relations between the two nations. Paasikivi explains the illegality of the Society and its actions to which Molotov responds by accusing the Finnish government of being anti-Soviet Union. President Kallio suffers a stroke, which leaves him partly paralyzed. Prime Minister Risto Ryti takes over presidential duties. Finland finishes demilitarization of the Åland Islands. University of Helsinki celebrates its 300th anniversary. Finland and Soviet Union sign a transit agreement allowing transport of Russian personnel and hardware to/from Hanko Peninsula via Finnish territory. Details of the proposed transit agreement between Finland and Germany are agreed on. Arriving German ships will use ports of Vaasa and Oulu. German troop transport ships arrive to Vaasa. Transit agreement between Finland and Germany is signed. War materiel shipments from Germany to Finland begin. Was Finland in the loop about Hitler's Barbarossa plans? It make me wonder if Germany was thinking long term and hoping Fins would join them. Just like Germany helping Franco out in Spain who as we know refused to join the war in the East but allowed volunteers to go on the condition they only fight in Russia. Last edited by STEED; 03-17-2016 at 09:32 AM. It make me wonder if Germany was thinking long term and hoping Fins would join them. Oh, most definitely. Finland is the one who started building better relations with Germany after the Winter War. At some point, Germany then started to see Finland as a possible guard of the northern flank for the planned Operation Barbarossa. EDIT: Guess I'll put this here instead of the Art Gallery thread. Colored from B/W photo by your's truly. Women's Auxiliary (i.e. Lotta) in air spotting duty. Last edited by Dowly; 03-17-2016 at 02:16 PM.